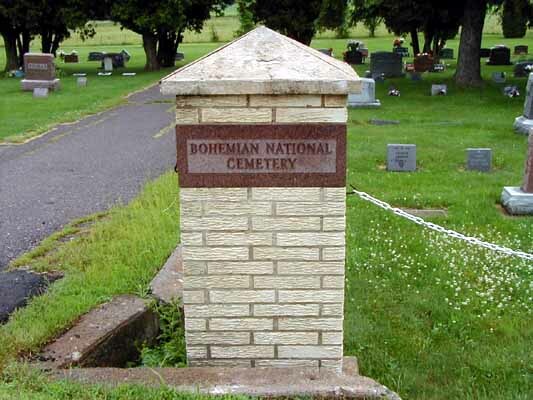 Nestled in the heart of the Bohemian farm settlement, the Bohemian National Cemetery is the final resting place for many of the Cadott area's pioneer Czech settlers and their descendents. Approximately 400 are interred at the cemetery. 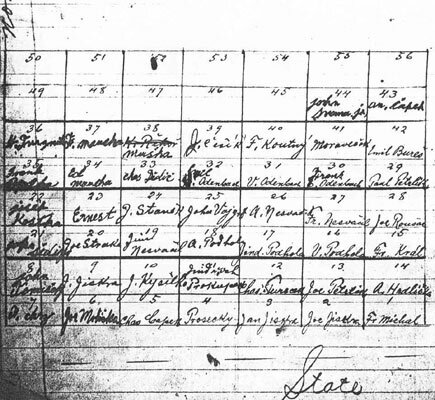 Josef Danzer, who died 21 November 1902, is the first recorded burial in the cemetery. Burials continue today. The cemetery is located 7 1/2 miles North of Cadott on Highway 27 in the Town of Arthur, Chippewa County, Wisconsin (Township 30N Range 6W Section 32). One-half mile south of the cemetery stands the Bohemian Hall. The hall, built in 1907, was the meeting and gathering place for Bratri Novych Hradu (which translates to Brothers of New Castles) Lodge #141. Lodge #141 was formed 17 April 1904. 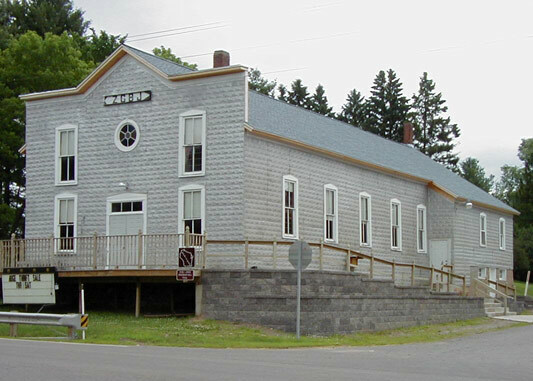 Hvězda Lodge #100 of Haugen, Wisconsin sponsored the 24 charter members; 18 men and 6 women. Both Lodges were part of the Zapadni Česko-Bratrska Jednota (ZCBJ), which translates to Western Bohemian Fraternal Association. The association was established in 1897 as a fraternal benefit society for Czech men. In 1899, women were also admitted. In 1947, membership in the association was opened to persons of all ethnic backgrounds. In 1971, the association changed its name to Western Fraternal Life Association (WFLA). In 1999, the cemetery association became a separate entity with Jim Michal of Chippewa Falls, Wisconsin becoming the president of the cemetery association. Many Czech immigrants were agnostic. In their homeland, they had been oppressed by the Austro-Hungarian Empire. Catholicism was forced on them by the ruling Habsburg Monarchy. Some Czech immigrants remained Catholic due to force of habit and/or truly believing in the doctrines of the church. However, many were finished with the authoritarian Catholic Church when they arrived on American soil and realized true freedom. Subsequently, much of their social life was centered around the Lodge and the many social events that took place at the Bohemian Hall. Secular funeral services were conducted under the auspices of the Lodge, usually held at the home of the decedent, with the casket in the parlor. The president of the Lodge would deliver the eulogy. Black pin-on ribbon badges were worn. The Lodge had a small choir which would sing at the funerals. Even though the services were not religious, Christian hymns such as Nearer My God to Thee, The Old Rugged Cross, and Just as I Am were often sung. Many of the interred served their country honorably in the Armed Forces. Frank Naiberg Jr. in World War I, Eddie Novak in World War II, and Delbert Kaska during the Korean War, just to name a few. Each Memorial Day, lodge members hold special ceremonies at the cemetery. Veterans place wreaths at the gravesites of the lodge members who have died in the past year. 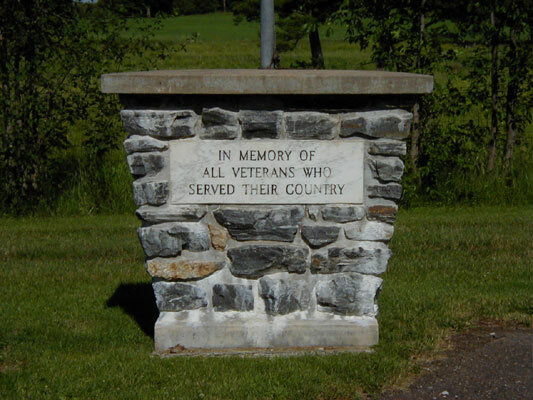 Charles Peterlik, with the help of several other lodge members, erected a monument as a special tribute to all veterans who served their country. The Z.C.B.J. Lodge No. 141 of Cadott, sponsored a Memorial Day program at the Bohemian National Cemetery Sunday, May 30 at 11 a.m. There were two speakers of the day. Mr. Rudolph Muska, a lodge member, gave an interesting talk on the history of Wisconsin and its growth to the present time. Also the part that Wisconsin boys took in the two World Wars. Mr. Wm. Buresh, the president of the lodge for many years, gave a very touching and interesting talk in the Czech language. The full program was as follows: Saxophone Trio, "America" by Marvin and Eugene Roshell and Jim Michal, Jr.; English speaker, Rudolph Muska; English song by Mrs. Wm. Roshell, Mrs. Eugene Turecek and Miss Mary Anne Buresh; Gettysburg Address by Carol Naiberg; Recitation, "Your Flag and My Flag" by Marianne Stanek; Recitation, "Memorial Day" by Irma Hickatheir; Saxophone Trio, "America the Beautiful" by Marvin and Eugene Roshell and Jim Michal, Jr.; Bohemian song by Mrs. Wm. Roshell, Mrs. Eugene Turecek and Maryanne Buresh; Bohemian speaker, Wm. Buresh, Pres. of Z.C.B.J. ; Bohemian song, Mrs. Wm. Roshell, Mrs. Eugene Turecek, Mary Anne Buresh; Taps, Tom Buresh, Jr. and Eugene Turecek; Carol Naiberg, age 10, delivered the Gettysburg Address very well. She was a 5th grade pupil at Dist. No. 8 School, Town of Arthur during the past year. After the program a very sumptuous pot luck lunch was served at the Bohemian Hall at noon. The cemetery committee, consisting of Josef Vesely (Joseph Wesley), Josef Fuchs (Joseph Fuchs), Jan Straka (John Straka) and Vaclav Muska (James Muska), voted to purchase two-acres of land for the cemetery. On May 12, 1901 the land was purchased for $16. 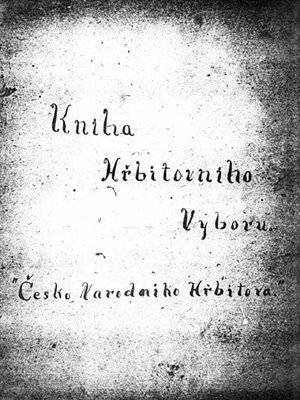 The Kniha Hřbitovniho Výboru Česko Národního Hřbitova, in English translates to The Book of the Cemetery Committee of the Bohemian National Cemetery, contains the burial and financial records for the cemetery from 1901 to the late 1950's. 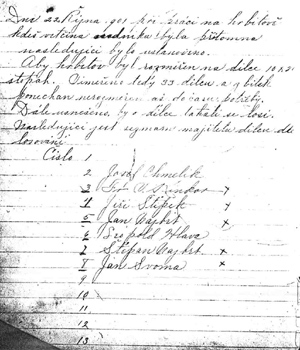 Early entries in the double-paged ledger are written in Czech. The following is a translation of the first entries in the book. On October 22, 1901 while working at the cemetery, where a majority of the settlers were present, the following decisions were made. The cemetery should be measured in plots of 10 X 21 feet. Thirty three plots are to be measured and the remainder be left unmeasured until more plots are needed. It was further decided that the plots were to be distributed by drawing lots. 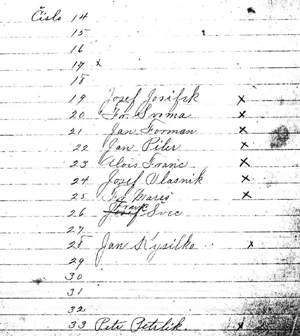 Following is the list of plot owners, with plot numbers, which were distributed by drawing lots. 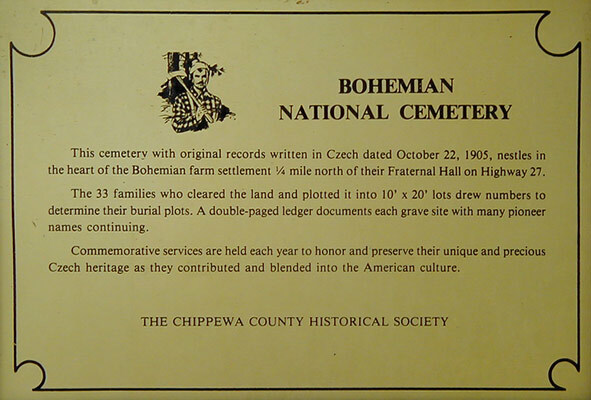 The Bohemian National Cemetery became a Chippewa County Historical Site in 1984. The following marker is located just inside the cemetery entrance. 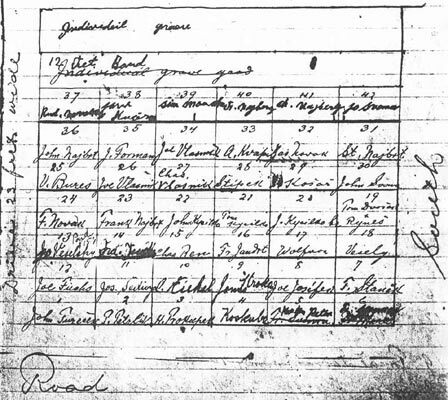 The first entry in the cemetery register is dated 22 October 1901, not 1905 as indicated on the historical marker. The following map, from the cemetery book, illustrates the layout of the plots. 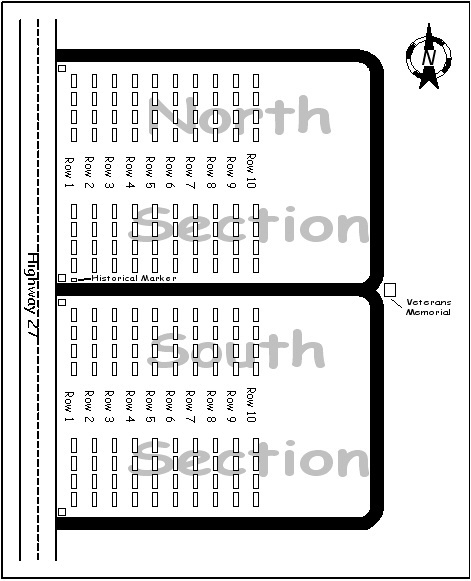 The cemetery is divided into two major sections, which I labeled North and South. Rows are numbered starting from the West side of the cemetery. Tombstone inscriptions are listed by row, from North to South. The majority of the tombstones in the cemetery are of granite and in excellent condition. None appear to be unstable or at risk of toppling over. A few of the tombstones are of a softer porous stone, possibly slate. Those tombstones are losing their battle with Mother Nature. Several are covered with lichen and have unreadable inscriptions. They are located in the shaded part of the South section of the cemetery. The shade prevents the porous stone from drying out between rain showers, therefore accelerating their deterioration. 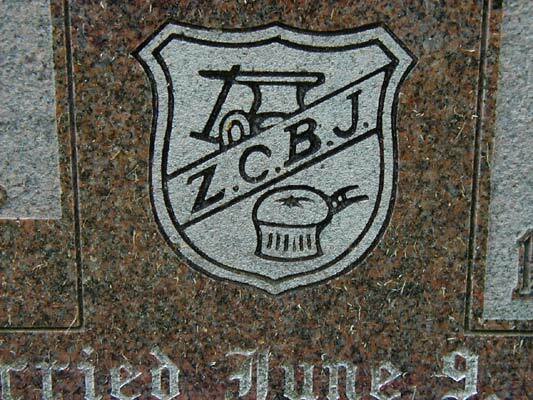 Several of the tombstones in the cemetery are decorated with the Z.C.B.J Lodge emblem. To preserve family connections/groupings, inscriptions are ordered according to the original layout of the graves. Use the index below to search for a surname. Click on the links in the Name column to access transcribed obituaries. Click on the links in the Inscription column to view tombstone photographs. Georgiana Sobola, who was taught the Czech language during Z.C.B.J. Lodge sponsored summer school, assisted in translating the tombstone inscriptions that were in Czech. Note: Slashes (/) indicate line breaks. A question mark in square brackets ([?]) indicates unreadable portion of inscription. Information not inscribed on the tombstone is also in square brackets. 1. Dates of birth are from tombstone inscriptions and/or obituaries. 2. Dates of death are from tombstone inscriptions and/or obituaries.